Email names are like your pet names. They stay in the tongues and minds with everyone you’re in touch with. That’s when you need to be looking for creative email address ideas no matter you need a personal email or a professional email address. I’ve previously written about email tips on the blog and in this article, I’ll help you come up with good email name ideas (even if your desired username is taken!). How to get a professional email address with your domain? Can an email address start with a number? A valid email address is the specific location of an email inbox which makes sure messages sent to that email ID get delivered to the exact email inbox. It is like your postbox on the internet. Of the 269 billion emails sent per day, each has their own email address and is unique to the recipient. Similarly, when you send an email to someone else, your email address decides whether your email can be trusted to open, trashed as spam or automatically land in the spam box (without even the receiver knowing it). To create a professional impression, having a professional domain (for example, my email address is swadhin@DigitalGYD.com) is highly recommended. This is because when you own a professional email address, people consider you more secure, invested in your business and it doesn’t look like spam. However, not everyone needs a professional email address. You can still have professional sounding email names without investing in a domain. Choosing a perfect email address is very necessary to remain trust-able and create a good impression. In this era of digitization getting your desired email address is a bit tough because nearly 50% of the world’s population now has a dedicated email addresses. Must Read:From a newspaper seller to getting accolades from Google, Microsoft & Apple, read Ritesh’s inspiring journey. Wondering how many email users are there in the world? According to statista.com, there were nearly 4.1 billion active email users in the world (in 2014) and the number is expected to rise to 5.1 billion by the end of 2020 which means getting your unique email address is next to impossible to matter what email name generator tool you use. Having said that, there are still workaround to get a clean, professional looking email IDs easily. Like I said, if you don’t want to invest in a professional domain, you need to register your email IDs through email service providers like Gmail.com, Outlook.com etc. While choosing your desired email service providers, you should remember that choosing a popular service like Gmail will make it hard for you to get your desired email name while a less used service like Outloook might still have your email name free to register. You Might Find This Helpful ›› Gmail Tips For Smart People : A list of 10 powerful and less talked about Gmail tricks that will get your work done faster, maintain an inbox zero and look smart in front of friends/colleagues. Click to read (opens in new tab). Now that you have a email service provider, you should quickly focus on settling over 2 or 3 of your desired usernames. This will form the base of our email address. After that, you can then rotate and use various cool email address ideas or mail id suggestions. This will make the work a lot easier than just testing each username with available free options and testing them each time. For example, you thought JaneSmith as your desired username. PRO TIP: Make sure your chosen email username passes the phone test. Meaning, if you call up a friend and pronounce your email ID, that person should be able to accurately write the spelling of your username without having to ask you. This is necessary because many times you’ll need to verbally share your email ID with friends, colleagues and they might further share it with their network. If the listener isn’t able to get the exact spelling or mistakes it with similar sounding ID, you might lose your confidential emails to someone else, leave alone the time loss. It is obvious that JaneSmith wouldn’t be available to register right away. So you can try the following simple email name ideas to combine with it. Reverse the name order: This is perhaps the best email name hack that you can try. If JaneSmith is taken, try SmithJane. Most of the times this is usually the only thing you need to try. Reverse names are the best email names ever because they still make the same sense without fancy supplements. Use Abbreviations: If the above email username trick doesn’t help, try using abbreviations of your username. Most of the time this wouldn’t be available but if it is, you’re in luck. Try SJane or JSmith as your email address. Alternatively, you can try using a middle name (if you have one) to up your game a bit. Don’t make it too long: While long, wordy usernames might look like cool email address ideas but are hard to remember and might attract misspellings. ALSO READ >>> How To Make A Website That Makes $6324 per Month! Adding your profession, educational qualification or any sort of professional skill that identifies you is a great example of a creative email names. Remember to make it professional and not add something like nick names or funny words or else yours would fall into the funny email addresses debacle listed below. This may sound a little unique but is a great way to create good email address names without having to hit your head on the wall. Simply add your home town’s name or abbreviation to make a great and memorable email ID. If all of those doesn’t work or your actual name is too big for your email username, you can try another simple email address idea which is to modify your same a bit. Try truncating it to create a short form. If you own a professional domain (read here how to own it) you can poke fun at the biggies with your cool email names like Google@example.com or president@yourdomain.com. Patricia Arty: Her college email id was one of the biggest funny email address examples you can ever find. She had an auto generated email username which was party@college.edu which is totally opposite of what you would want to see as a college’s student email id. I hope you liked the above list of funny and weird email address ideas. We could go below the lines but didn’t want to, if you want more vulgar or adult email name ideas, a quick search on Quora will get you there. It simply is beyond the scope of our article. 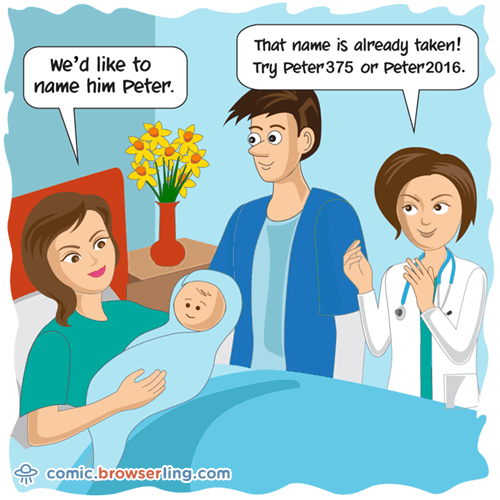 Take his surname: If you’re taking his surname as your last name, use it to create a new couple email address. For example, Sarita Agarwal when married to Rajesh Goyal can make a new email id (saritaagarwalgoyal@gmail.com or something similar). Choosing a professional email address is much tougher than choosing a simple personal email address. You need to create an business email address you need to make sure it is professional and doesn’t look spammy. The best way to get your professional email address is to invest in a domain (not more than $5 per year) because that looks more professional and you can use any username you like for different purposes. When you create a professional email address on your own domain, you are free to choose whatever username you wish, even for your team members or a separate one for each separate purpose of email. services@yourdomain.com to name a few. biz@yourdomain.com: This is a great alternative to info email addresses if you mean business for your clients. It’s better than any of your info@ based typical business email addresses. hi@example.com: Another substitute for info based addresses and getting a more personalized and inviting email username. You can also use any role based email addresses for your clients and visitors which defines who they are going to be in contact with. Like editor@example.com or HR@example.com if you want to get your visitors to connect with your editor or HR. Here are some cool and more approachable sales@ email address alternatives that you can use to make the process of client or visitor on-boarding more approachable and easy. hello@yourdomain.com: This is a very popular and professional alternative to sales email addresses for business people. You are inviting them to get in talk and that’s what you should do rather than screaming SALES. growth@yourdomain.com: This is a bit narrower alternative but more focused onto what you need with the customer or say what the customer can expect from you. Here, it means growth of their business or something similar. If you’re a company or agency getting more visibility for your customers, you can use visibility@example.com in place of sales@ email address. You can easily get a professional email address with your domain by simply registering your preferred domain name at one of the domain name registrars. You can do that in 2 minutes using a service like Namecheap which is my preferred domain name registrar (I have over 26 domains on that platform!). The above procedure is great if you simply need a domain name for registering a professional email address. But, in case you want to set up your own website (or have plans to create a profitable blog someday) you should register your domain from a hosting company like Bluehost. Click here to read about 10 amazing things you can do with your domain to boost your brand and business. They offer you a free domain for lifetime and space for hosting your website. Click here to get a FREE DOMAIN with Bluehost or read the step by step guide to create your money-making blog. Another advantage of having a professional email address through your domain is you don’t have to be resourceful about searching creative email names, you can choose any email address you desire with your domain. I hope you liked the our best email name address ideas and are ready to register your unique email name. But, before that, I’d suggest to avoid these terrible mistakes when choosing an email address. Email addresses, once registered, become permanent. This is worse if you have distributed your email ID with your friends, and business clients. Changing them often is not a good idea. That is where you need to make sure you follow the email name best practices to avoid embarrassment. Do not use numbers: Numbers in your email address should be the last thing you should think of. Numbers make the email ID more clumsy. Do not use random words: Random words movie phrases make your email address look funny. You might not intend having an email ID for business purpose but that doesn’t mean you will not be a professional someday. Do not be flirty or use childish words: Having a email name like coolprincerob or machohunkbilly might not only put you to embarrassment but also look spammy. Do not use your spouse’s name: Some people out of love add their spouse’s name like JaneTimothy or Robmartha which is great if you are using the email address strictly for communicating with your date. But other than that, it will create a bad impression when you share it with others. Don’t use meaningless or too short shortform: If your email address is something like actrbrian for actor Brian or hmeconstructrjack for something like homeconstructor Jack nobody is going to take the pain to remember it. Moreover, typos can land your email in someone else’s inbox. I hope you liked our best email name ideas and sparked off an idea to register a unique email address for yourself. If this guide did help you, kindly share it on your favorite social media platform. Do you have some cool email name tips and tricks that has worked for you? Would you like to suggest some great email name ideas to our readers. Please leave a comment below and let’s discuss the email name best practices. Yes, an email address can absolutely start with a number. You can also use a number in your email address anywhere in the middle or at the end too. Having said that, you should not consider adding a number in your email id unless you absolutely need to. It makes your email username more confusing. Try our other email address alternatives listed above to find a better alternative to a number based email address. WPX Hosting Review 2019: Is It Worth Your Investment? How To Become A Facebook Celeb & Promote Your Blog Like A Boss. This is very great article is very great. Thanks for theis cool and creative email address name ideas. I just found my dream email username using your tips!